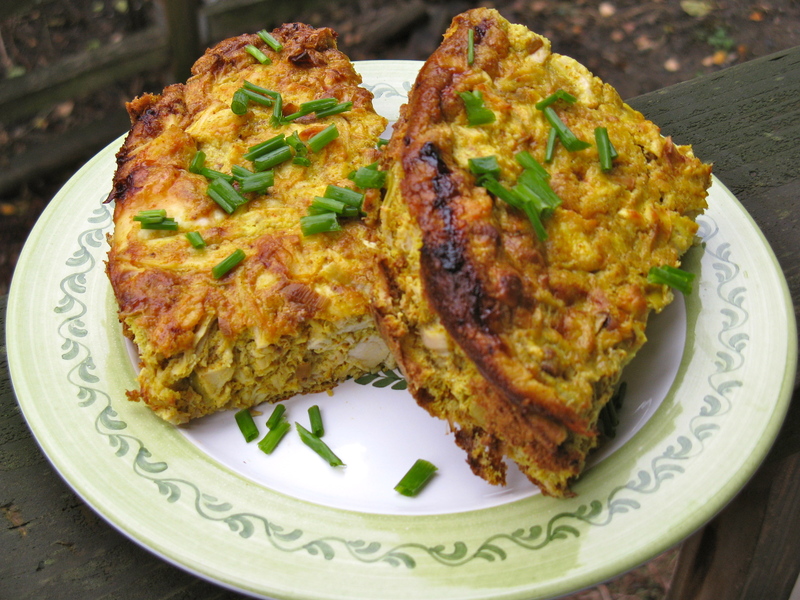 Eggs, butter, chicken and curry powder…need I say more? 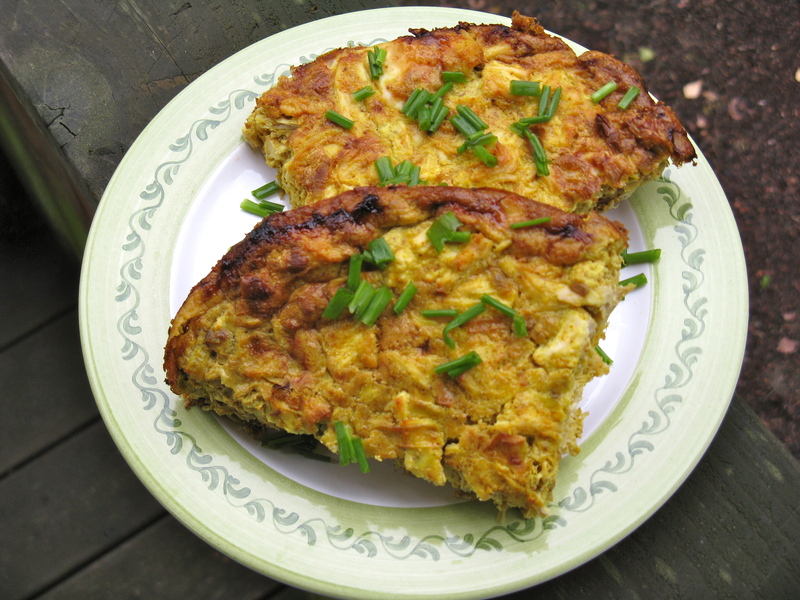 This chicken curry egg bake is out of this world delicious and a great recipe for any meal of the day. This egg dish has a beautiful presentation when it first comes out of the oven. It’s puffy and soufflé-like, but then quickly deflates. I recommend serving it with steamed or sautéed leafy greens, but feel free to serve it with whatever veggie you like. Avocado on top is great too. Preheat oven to 400 degrees. Grease a 10-inch pie pan or 2-quart casserole dish. Melt a little butter over medium heat in a medium-sized skillet. Add leek and sauté for a few minutes, until softened. Remove from heat and set aside to cool. In a large bowl, whisk together the eggs, melted butter, and coconut milk until frothy. Next, add the shredded chicken, sautéed leek, curry powder, and sea salt and pepper. Mix well. Pour into the greased casserole dish or pie pan. Bake in the oven for 40-45 minutes or until golden brown and puffy. Serve with vegetable of choice and garnish with chopped chives, if using. Yum yum yum!! 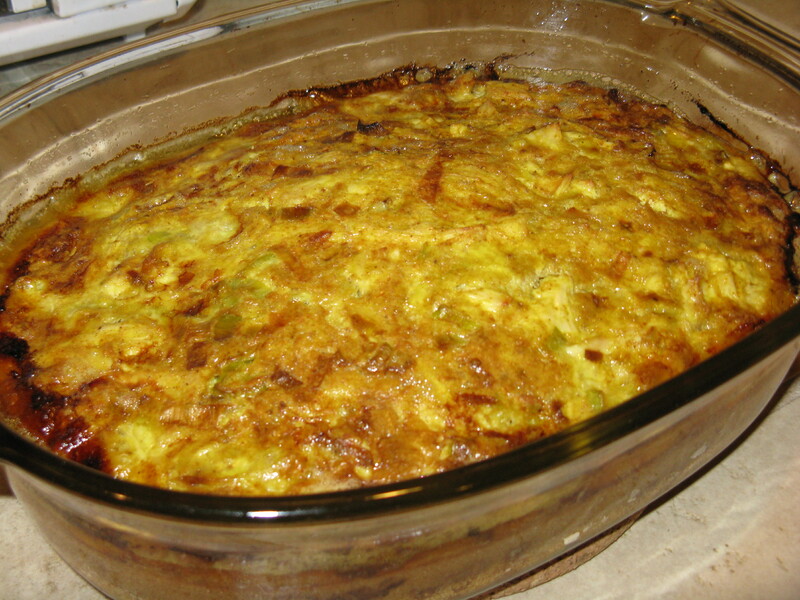 Have you ever tried using almond milk instead of coconut for this type of “quiche” dish? I have a boat load of almond milk at home that I wouldn’t mind using. No, I haven’t. It’d probably work fine, but I’d recommend using less since it’s not as thick. Watery egg dishes = gross! This is in the oven right now for the rest of this week’s lunches. It’s the 3rd time I’ve made it. LOVE it!! I use a diced red pepper in place of the leek. Thank so much for the recipe! Wonderful and nice with the addition of the red pepper! I absolutely love this recipe too and your comment reminded me that I haven’t made it in a long time! I’m so glad you enjoy it, Kim! Sounds delicious. Do you think a sweet element like cranberries would help? And does this taste like scrambled eggs or different? Thanks! This dish is really delicious as is and I don’t recommend adding cranberries (interesting thought though). Personally, I don’t think cranberries would taste good in this anyway, but if you think it sounds good and want to experiment with it, go for it! This has more flavor than plain scrambled eggs and is a little bit different texture. It’s kinda like a frittata, but fluffier. It’s full of flavor from the curry, butter, and leek, and the shredded chicken adds some nice texture. Hope that helps! Thanks so much for replying. One last question: I take it this dish is best served straight from the oven. What if it comes to room temperature? Will it still taste good? I ask because I plan to take to to my friend’s for thanksgiving and am wondering if I should bake it at her house or bake it and take it with me? Yes, it is best served straight from the oven, but is still delicious reheated. It’s puffed up when it first comes out of the oven, but this dissipates once it’s cooled. Regardless, it’s best eaten warm versus room temp, even if you do need to reheat it. If there’s room in your friend’s oven on Thanksgiving to bake it, I’d recommend doing it there, but it’s no big deal if you bake it ahead of time. Thanks so much. Appreciate your getting back so promptly. Will let you know how it turned out. Happy Thanksgiving to you and your family! Made this with 4 TB butter (to cut some of the saturated fat) and using leftover chicken curry. Was delicious and making it again tonight! So glad you enjoyed it and found a way to make it work better for you! Thanks for sharing!